My first week of the Tour de Fleece has been not quite as dramatic with wooly exploits as other years. The stars finally aligned so that a friend and I were able to schedule some long-awaited time to make an effort to tidy up my yard & gardens, so many hours were spent with a shovel in hand. Some was spent with my friend’s most wonderful company & guidance and some working furiously on my own to carry out the plans we’d laid. I’ll share more on this experience later, but I am happy to report that I completed the last big push for the job yesterday — whew-hoo — and I’m so incredibly happy with the results. As you might suspect, the hours spent in the garden has been time not spent with my wheel and has been a workout for my hands and back that hasn’t necessarily been spurring me forward in the Tour de Fleece. 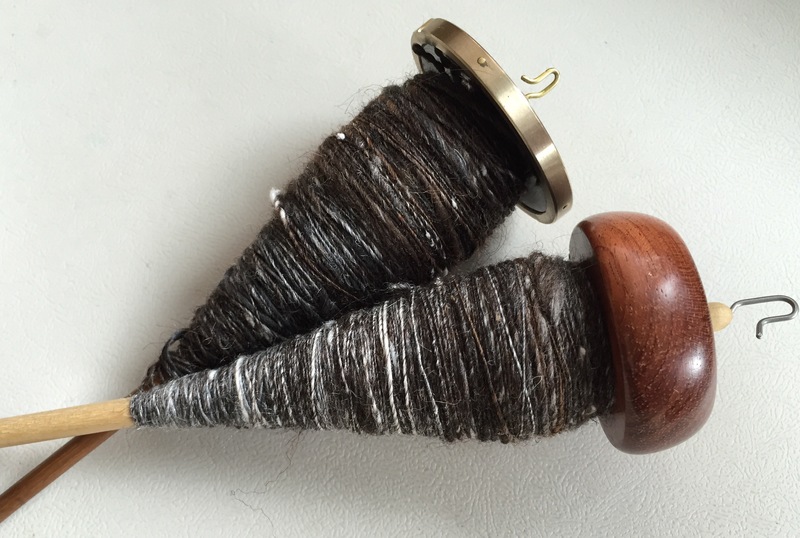 But I’ve spun daily and made steady progress and really that was the main goal this year. I finished up the 4oz of the luxuriously lovely blue called During the Day. I photographed it here with my bobbin of Early Blooming with which I plan to ply it. 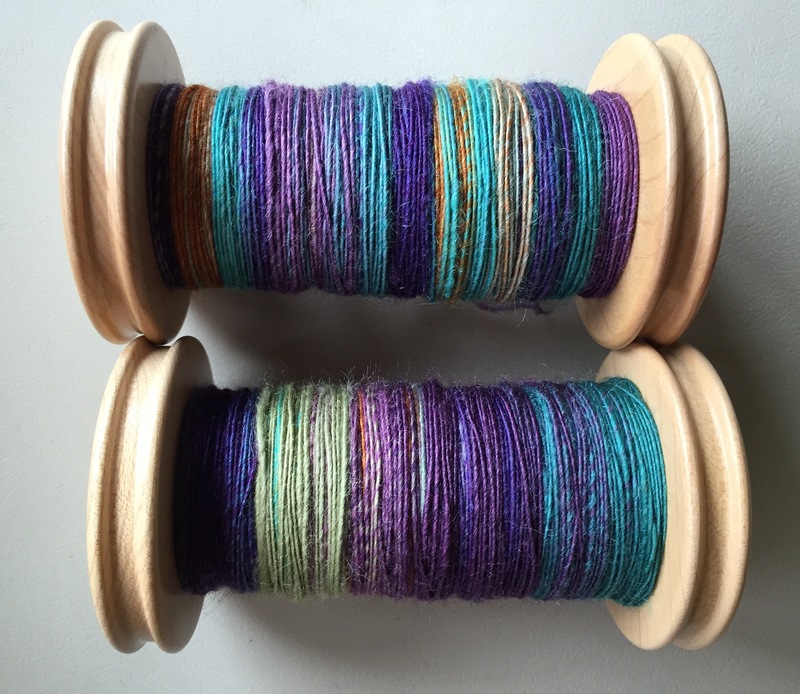 I also managed to spin up 4oz of the lustrous ‘Laundry Pile’. I spun these singles a bit thicker and I’m hoping to have about a worsted weight 2ply with lots of barberpoles in it. Currently on the wheel I’m working on the Three Waters Farm official Tour de Fleece 2016 colorway, Summer Jubilee in the Superwash Merino/Nylon blend. Also in progress, I have one Classy Squid Fiber Co spindle spin in the works. This is my very let-your-hair-down spin — something I’m learning to embrace with batts and rolags from Classy Squid Fiber Co. I’ve really come to love just letting the texture have their way. 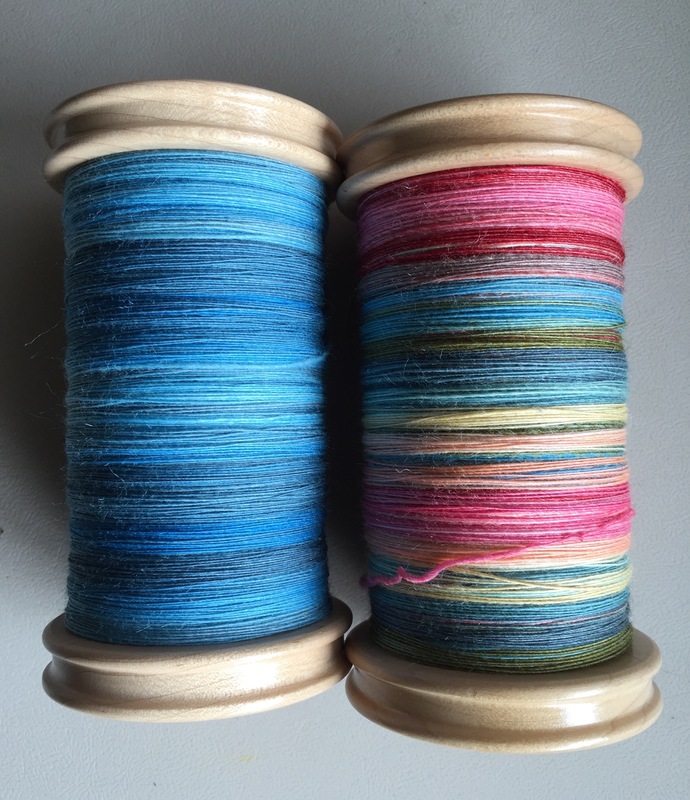 This is my first experience spinning texture on spindles and it’s been such a treat. I have another ounce of rolags to spin which I’ll do on spindles and then a coordinating 2oz batt that I plan to spin on my wheel and then ply the two together. This is Three Waters Farm ‘Satisfied with Summer’ just started on my new Akerworks mini spindle. I’ve been spinning just a staple length or so per day, so the progress is very slow but I adore how quick this little .41oz spindle flies and the ultra lightweight yarn it loves to create. And that’s it! That’s my week 1 for the Tour de Fleece! I hope you’ve had a great week, too, if you’re spinning! all this AND yard work? wow! I’m kind of tired today. LOL! 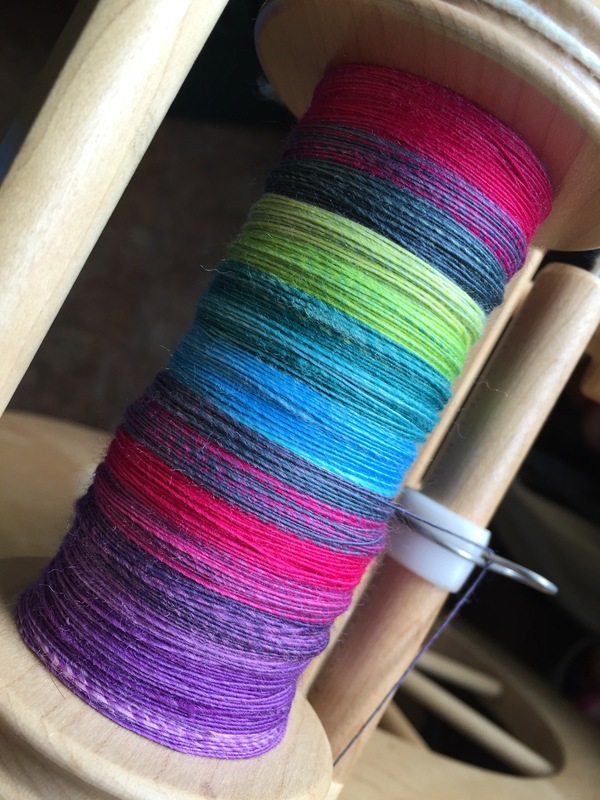 Your wonderful spinning and the beautiful colorways brought joy and inspiration to my day!! Wonderful! I’m so glad — thank you for your kind words! Love all of your spining!! 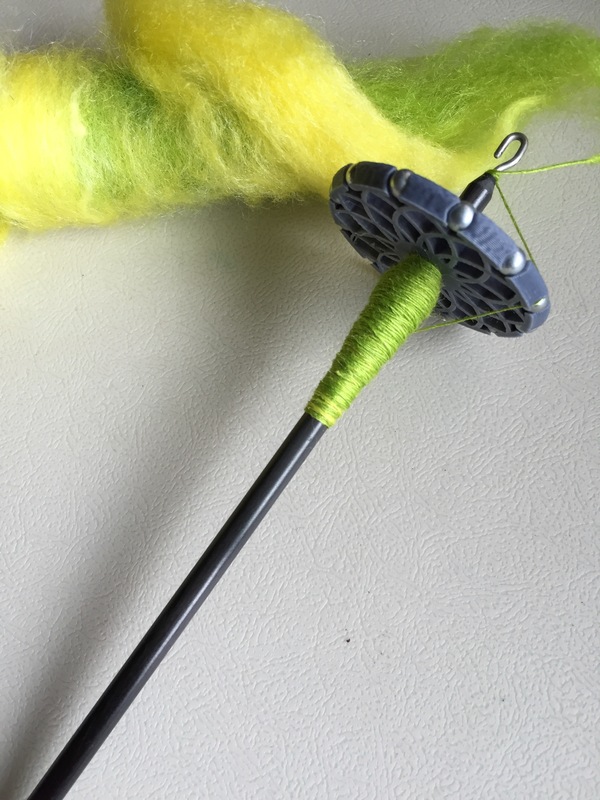 I have two spindles and have not tried them yet, need to give it a try some day soon. Absolutely! I will say I had an easier time with the wheel at first, but I adore my spindles now! And this is LESS than you get done in a normal Tour de Fleece? The quality, colors and amounts are wonderful!